Is Earn at Home Club Scam? Read Before You Register! Online business opportunity scam strikes again. 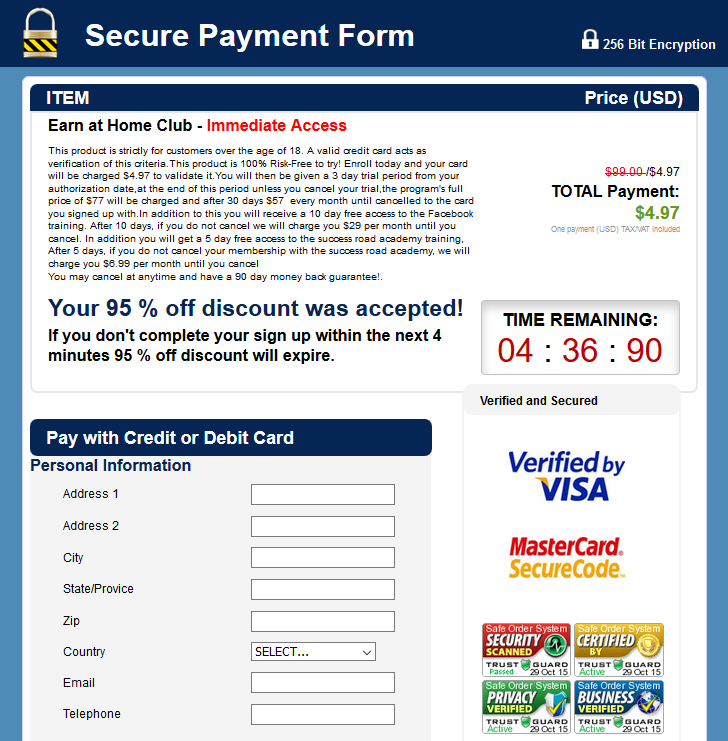 Earn at Home Club scam is a classic business opportunity scam. If you see this review before signing up for it, consider yourself lucky. Read on to see what it is about without subjecting yourself to a financial nightmare. The name of the “opportunity” is quite self-explanatory: well, it’s an “earn at home” business opportunity, and you need to pay to join the club, of course. Paying for legitimate trainings and business opportunities is fine, but unfortunately Earn at Home Club isn’t one of them. It’s just a classic online scam. Usually unsuspecting internet users come across this “news article” before they are introduced to the sales page. On the surface, this page seems like a normal article or a blog post, but every link you click will lead you to the sales page. This is just a sales page disguised as a news article. There’s no other article within that site. If you click on any of the links, you are brought to the sales page. Before you continue, you are required to fill in some of your details. Usually, other programs don’t ask for your telephone number to create an account. If you see something like this in the future, be alert. Don’t give away your telephone number so easily. If you provide your telephone number, even if you don’t buy the product, you will be bombarded with calls from salespeople pitching you even more bogus online opportunities. I’ve been there, and it’s not fun at all. Don’t give away your phone number! Even when I was writing this review, I was hesitant if I should sacrifice my old phone number. Just when I was trying to close the browser window, a pop up appears! Ermm.. But I didn’t even fill up anything? Guess they really want my money pretty badly. Did you realize how they employ the scarcity tactic to make you read through the sales material quickly? By announcing a very limited number of available spots coupled with a 5-minutes tickling countdown timer, an inexperienced user often feels compelled to skimp through the materials quickly, leaving them no time to analyze the product rationally. I read through the rest of the sales page, and they did not even disclose any specific information about the business opportunity. All I was presented was some fake checks and Clickbank earnings, along with generic testimonials, and no other information were given about the Earn at Home Club. One interesting note: Earn at Home Club sales page attempts to explain what they are not, instead of explaining how their business model works. This is what separates a scam from a legitimate online business opportunity – the real one tells you how the online business works, and lets you try it out with no obligations, be it giving away telephone number or credit card number. There is simply nothing to hide. If a user finds it useful, he/she will naturally pay for it, after trying the product for free. Not like it’s a physical product that requires shipping fees anyway. Let’s say you had no time to detect all the warning signs that appeared up to this point, and decided that it’s a good idea to join Earn at Home Club scam. If you click on any link, you will be brought to this payment page. Since the price is only $4.97 and there is a money back guarantee, what can go wrong? Let me tell you this: it can go very, very wrong. Again, you are presented with a fake countdown timer in the payment page. If you refresh the page, the timer restarts. But anyone who sees the timer wouldn’t have time to read the fine prints. They will be so busy giving away their credit card information, and signing themselves up for a financial nightmare. Enroll today and your card will be charged $4.97 to validate it. You will then be given a 3 day trial period from your authorization date at the end of this period. Unless you cancel your trial, the program’s full price of $77 will be charged and after 30 days $57 every month until cancelled. You will receive 10 day free access to Facebook training. After 10 days, if you don’t cancel we will charge you $29 per month until you cancel. You get 5 day free access to the success road academy training. After 5 days, if you don’t cancel your membership with the success road academy, we will charge you $6.99 per month until you cancel. The total cost is a lot more hefty than the promised $4.97! Earn at Home Club scam signs you up for many other “business opportunities”, including Facebook training and success road academy which weren’t even mentioned at all in the sales page. I wouldn’t keep my hopes high for their 90 days money back guarantee too. Why would you trust a company that wouldn’t disclose the true costs and its business model? Should I Buy Earn at Home Club? The answer should be obvious by now. The final verdict NO, THIS IS A SCAM! Most victims fall prey to scams simply because they don’t know there are better alternatives out there. Read Our Review of the Most Recommended Internet Business Opportunity Here. Have you encountered any scams before? Personally I’ve fallen for a few before coming across the legitimate one, so let us know in the comments below if you have any personal experience to share! 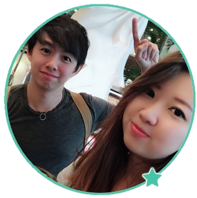 The A to Z Cash System Review – Scam or Legit? Ultimate Home Profits Review – Another Scam? Hey, I’m a financial blogger as well and certainly do not want my readers to be led astray. Side gigs are a good thing if you are doing something legitimate to earn money. Thank you for reviewing this product, I hope you rank well so Home Club doesn’t lead others to ruin. Oh no! This sounds scary! In my younger years I have fallen for a scam or two like this, and they sure make it difficult to cancel a subscription once you take the bait! So let me get this straight… they want $86 a month from their subscribers? $57 + $29? Wow…. that is a lot of money to be asking for when we aren’t even sure what they are selling! I have heard of your #1 Recommended Product, Wealthy Affiliate. Sounds great so far. $47 a month is affordable and I like how they offer a free month for you to try their program before you decide if you want to stick around. Thank you for your article, I look forward to reading more from you in the future! Hi Thomas, you are right, Earn at Home Club scam make it extremely hard to unsubscribe from the various scam services once you’ve fallen for the scam. On the other hand, Wealthy Affiliate is indeed one of the best online platforms I’ve come across. The free membership doesn’t just last a month though, you can remain as a free member for as long as you like and keep your websites. You can choose to go Premium only when you are ready for advanced training. I’m glad you enjoyed the read! I have seen this ad a few times and managed to avoid the trap. Many of the points you make stuck out in my mind. The amazing thing is I have seen this on high end sites like Entrepreneur Magazine’s website so the level of trust on the product will be higher. I cannot believe that big sites would even consider running this type of ad. Thanks for the heads up on this one. Thanks for information and that remind me not blindly believe everything. Yes, definitely this ”masterpiece” called Earn at Home Club scam is a classic Business Opportunity scam. Unfortunately we all learning from own mistakes is painful but solid way. Yes, we do all learn from our own mistakes. Hopefully with these reviews people can learn without having to pay for silly mistakes like this. It’s amazing the amount of scams that opt to use this sales page disguised as a news article these days. I suppose their must be a high click through rate with them as they keep coming out. This looks like an incredibly dodgy opportunity – thanks for covering it truthfully and showing us what it really is! I do believe they have a high click through rate, it seems quite legitimate from its presentation and it taps on the topic of making good money online, which is entirely possible. This is just not the correct program to join. Thanks for the review! There are so many scams online these days; for those of us just now starting to look at online opportunities it can be really daunting trying to figure out which ones are legitimate and which aren’t. I can’t believe they haven’t been shut down yet with such obvious false advertising! This is a good reminder to always read the fine print on everything though. The fine print on this program is ridiculous! I believe when a scam gets shut down, another sprouts. There are just too many out there. As consumers we what we can do is to be vigilant and be skeptical when giving out important personal information like phone number and credit card details.